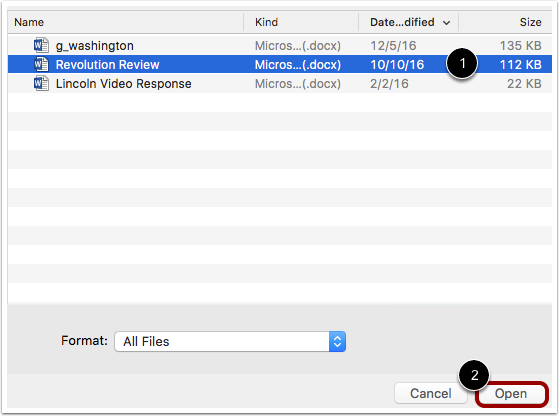 If your instructor allows file attachments, you can attach a file to a discussion reply using the attachment icon. 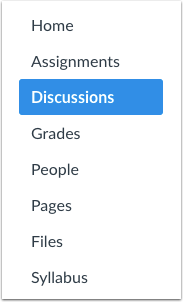 Attachments can be added to both graded and non-graded discussions. Any attachments added as part of discussions are copied to your user files. Attachments for graded discussions are not counted against your user quota and cannot be deleted. If the attachment icon does not display, this option is not available in your course. If your attachment causes you to exceed your user file quota, the file may fail to attach to an ungraded discussion. If you have permission to edit or delete discussion replies, editing a reply also allows you to remove an attachment. Click the title of the discussion you want to participate in. After adding content using the Rich Content Editor to the discussion reply , click the Attach link . Note: If you do not have a file attachment icon in your Discussion reply, your instructor has disabled this feature. Depending on your browser, click the Choose File or Browser button to locate personal files on your computer. Note: Once an attachment is posted to a discussion post, the attachment cannot be deleted. Browse personal files on computer and select the file or files you wish to attach . Double click the selected files or click the Open or Choose button  to upload the files to the discussion reply. Note: You can only upload one attachment in your reply. View your discussion reply. Your attached file will appear under the text. Previous Topic:How do I reply to a discussion as a student? Next Topic:How do I embed an image in a discussion reply as a student? Table of Contents > Discussions > How do I attach a file to a discussion reply as a student? Hi everyone, I am Dorcas Atwer and this is my super hero showing the type of person i am or would like to be in the nearest future. I want to be in a medical field as a Nurse practitioner. Again i am taking this class because is a requirement and i also want to improve my language, be more fluency and know a lot about English per say. Thank you. Sorry to be the bearer of bad news, but this post was shared in the Canvas Community instead of your Canvas course. The Community is a place to learn and share ideas about Canvas, rather than submitting your actual assignments or discussion posts. To find your Canvas course, you will need to log in to Canvas (Eagle ) here: Log In to Canvas. From there, located your Canvas course and post your discussion on the Discussions page. Please let us know if we can help you find this! Good luck. Re: How do I attach an MS Word document (att. below) in canvas? I'm just getting the link without the file.